This religious tapestry "Madonna's Coronation" shows the work of Gothic artist, Gentile Da Fabriano (1370 – 1427) from around 1420. From the Renaissance era, this Italian painter produced many works of religious subject matter, including the Adoration of the Magi, Flight into Egypt and Scene of the Nativity. In this work, we see the Coronation of the Virgin Mary. The scene represents the crowning of Mary by Christ, as the Queen of Heaven. The coronation takes place in heaven though represented often as an earthly court. A white dove symbolising the Holy Spririt is also seen in this work, and is often present in other renditions of this scene. 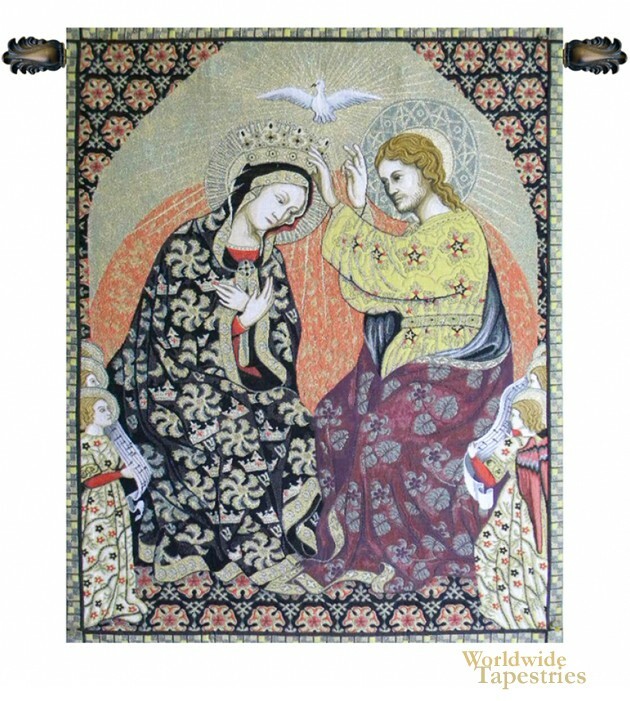 This religious tapestry "Madonna's Coronation" is lined and has a tunnel for easy hanging. Note: tapestry rod and tassels, where pictured, are purchased separately. Dimensions: W 50" x H 64"